When planning a lighting scheme for your bathroom it is important to ensure that the fittings you are looking to purchase can be installed in their desired location. All light fittings have what is known as an IP Rating, it is this rating that determines where a light can be installed. More information on IP Ratings can be found in our IP Ratings Explained page, please click here to visit. Once you have ascertained the IP Rating of the fitting, please use the guide below and the map opposite to see if it can be installed where you would like. The interior of bathtub or shower tray – IP7+ and low voltage supply (max 12 Volt). 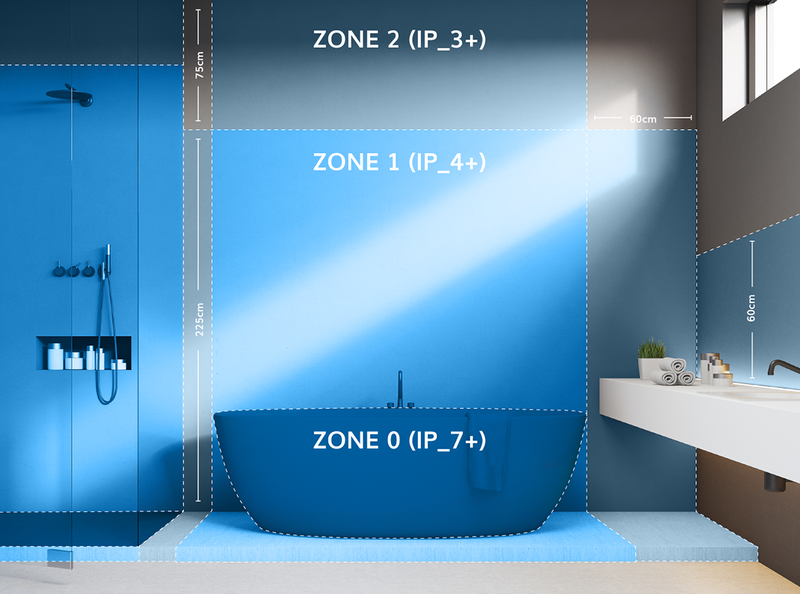 The Perimeter of bathtub or shower tray up to a height of 2.25 metre above the floor- IP4+ Use IP5+ where water jets are used for cleaning purposes. The Perimeter 0.6 metre wide around Zone 1 and 0.75 metre above Zone 1 – IP4+. Use IP5+ where water jets are used for cleaning purposes. The Perimeter 2.4 metre wide around zone 2 and 0.75 metre above Zone 2 - Use IP5+ where water jets are used for cleaning purposes. Otherwise no specified IP rating required although lights should be suitable for their location and provide adequate protection against electric shock. The space under the bath tub is Zone 1 if accessible without the use of a tool or outside the Zones if accessible only with the use of a tool.